Product information "Bosch TAT3A0133GB black 2 slice toaster"
The Bosch Village Collection toaster has a simple design which will look great in any kitchen, and goes perfectly with the Village Collection kettle. Featuring two slots, automatic bread centring ensures even toasting and an electronic sensor guarantees perfect results. Variable browning control lets you make sure your bread is toasted the way you like it and there's an integrated bun warming function as well as integrated defrosting. The high lift function lets you easily remove smaller bread slices safely, and the non-slip base adds stability and safety. 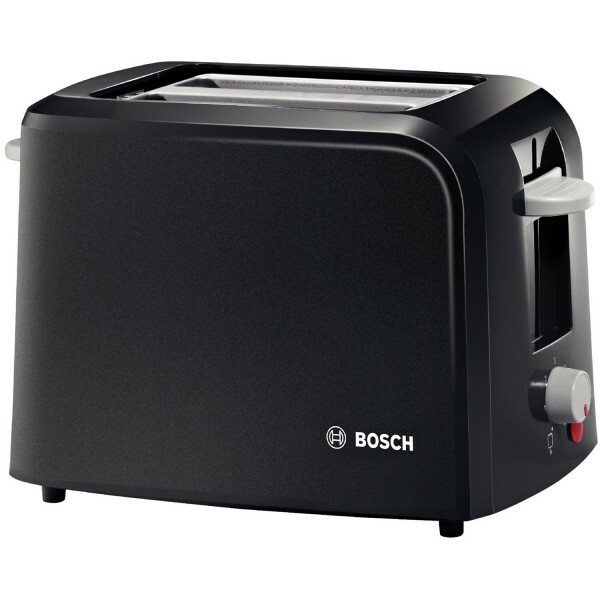 Related links to "Bosch TAT3A0133GB black 2 slice toaster"
Customer review for "Bosch TAT3A0133GB black 2 slice toaster"